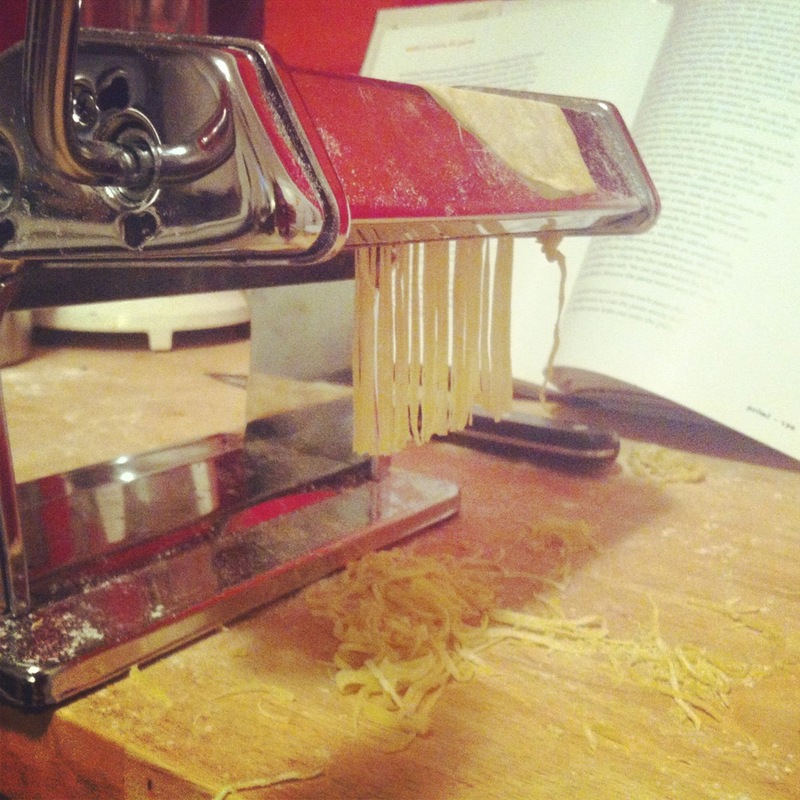 I recently started reading the book, Heat and became obsessed with the idea of making homemade pasta. I really was tempted to quit my job and move to Italy and learn how to make pasta. In the book he talks about how the only way to really learn is to learn from someone in Italy who has been doing it their whole life. Although I studied in Rome my Italian is not strong enough to pack up my life and move there. So for now I will practice making it in my kitchen. 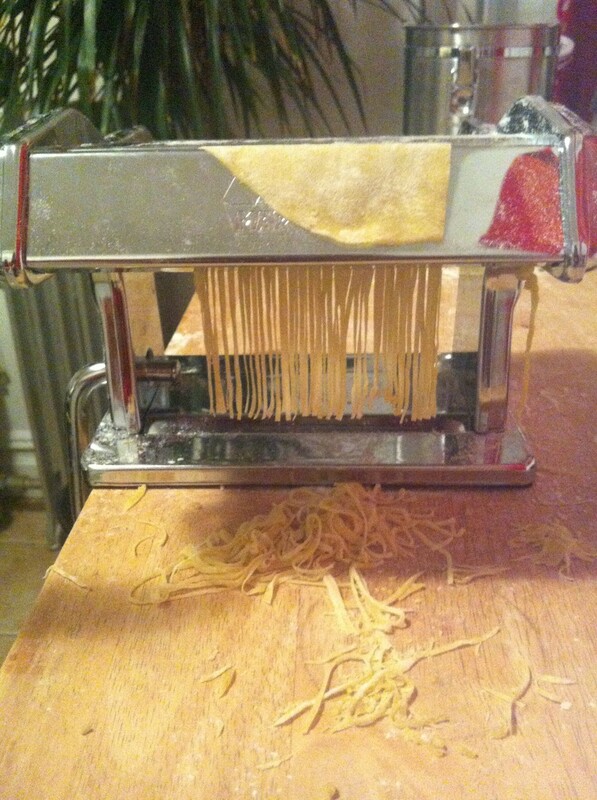 I just went out and bought a pasta roller, (I know it's not authentic), and am loving this machine. 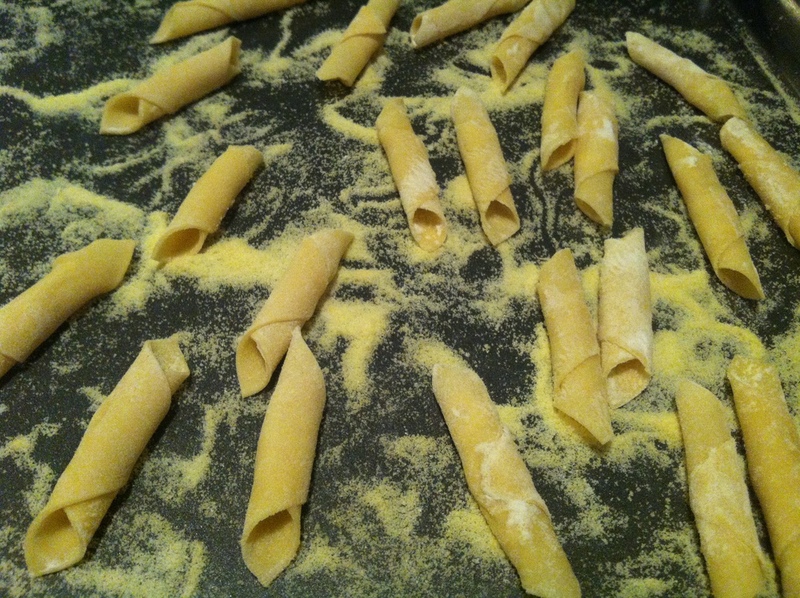 This post will be updated as I learn to make new pasta shapes, new dough recipes and new sauces for my homemade pasta. Hope you enjoy! I am just testing out my new machine. The roller has two different attachments one for a thick linguine and one for angel hair. I am going off a dough recipe from Mozza my favorite Italian cookbook. The first dough recipe I used was the basic pasta recipe. This was very eggy. Which kind of concerned me because in Heat the author says his Italian pasta teacher uses only one egg. I went along with the recipe anyways just to test it out. I made both the angel hair and linguine. When I kneaded the dough I kept smelling for the gluten pasta smell. Once you smell this you know your dough has been kneaded enough. It took around 20 minutes. The angel hair was sticky and didn't feel like I used enough flour. When it was sitting on the cooking sheet it would stick together. But when I cooked the angel hair it was good. Nothing special. The linguine held a little better. 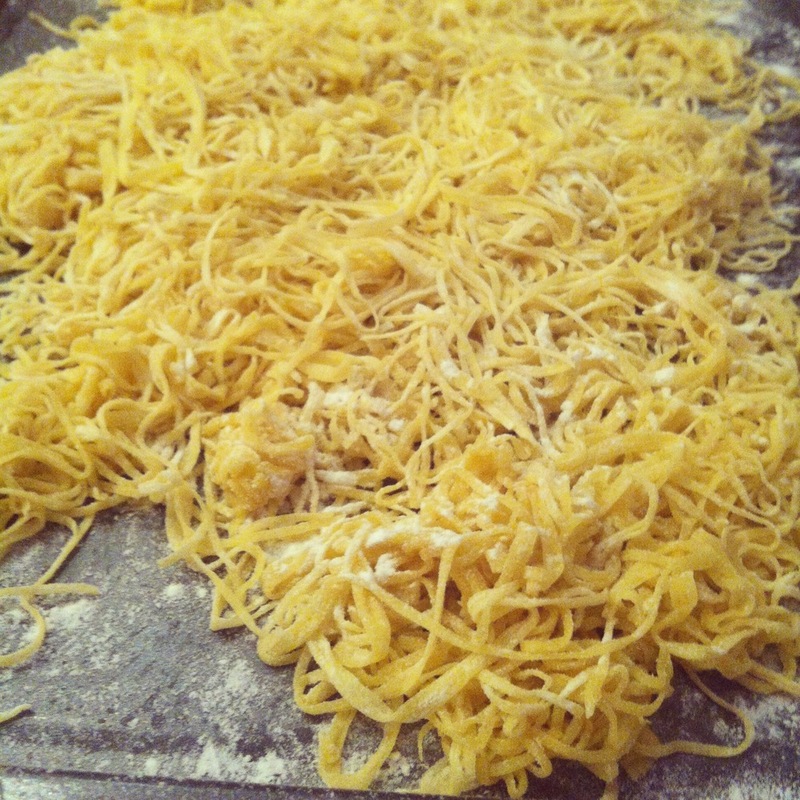 This is the linguine cooked. It was good! It didn't stick together which was nice. At this point though it was around 1 am and I needed to go to work the next day. I would continue to try new shapes later. Cacio e Pepe is an incredibly simple but delicious Roman dish. Pecorino cheese and cracked black pepper on top of some type of noodle. Since I'm not perfect at making pasta I thought this would be a simple sauce to make. I think I got a little ahead of myself because this dish was quite possibly the worst thing I have ever made. YIKES! I wanted to make the Cacio e Pepe with the angel hair pasta. BUT I wanted to try another recipe that was less eggy from Mozza. This is where things went wrong. I started making the Semolina dough. I thought since angel hair was so simple it didn't matter what dough recipe I used. The pasta would be good no matter what. Since there was no egg in the dough the pasta didn't have the right consistency. When I started cooking the angel hair it completely turned to mush. The pasta was bad. I failed. Terribly. In fact in the middle of dinner Danny got up and made an excuse to run an errand so he could stop eating it. I needed redemption! I couldn't get discouraged. I needed to prove to myself I could do this. I threw out the angel hair and moved on. 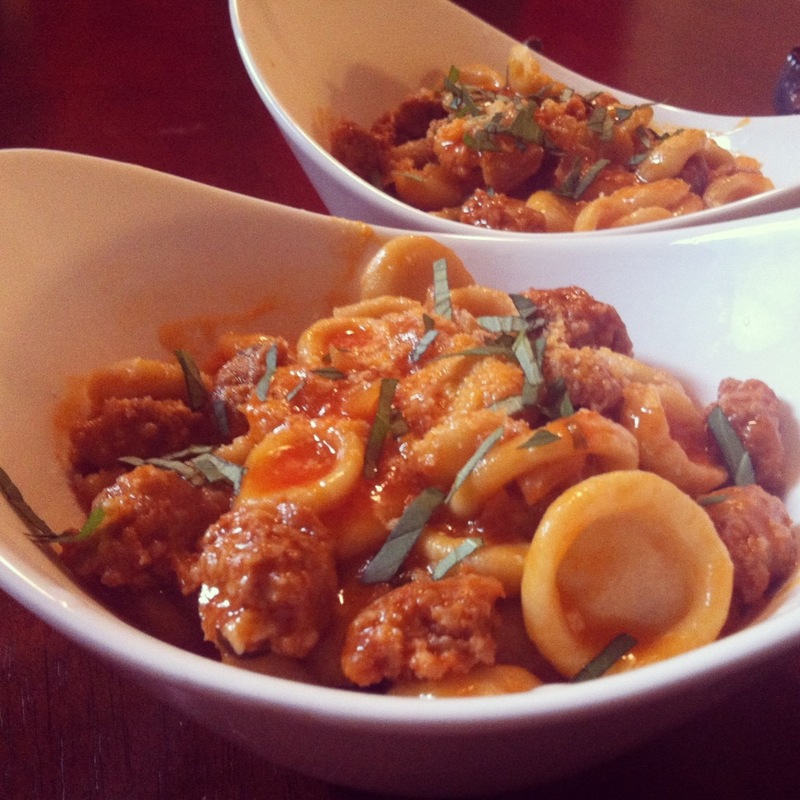 My favorite pasta of all time is Orcchiette. When its made right and cooked al dente it is delicious with any sauce. I went off of the recipe from my book and started making little tiny ears. I made about ten, cooked them and thought wow this is WAY better. 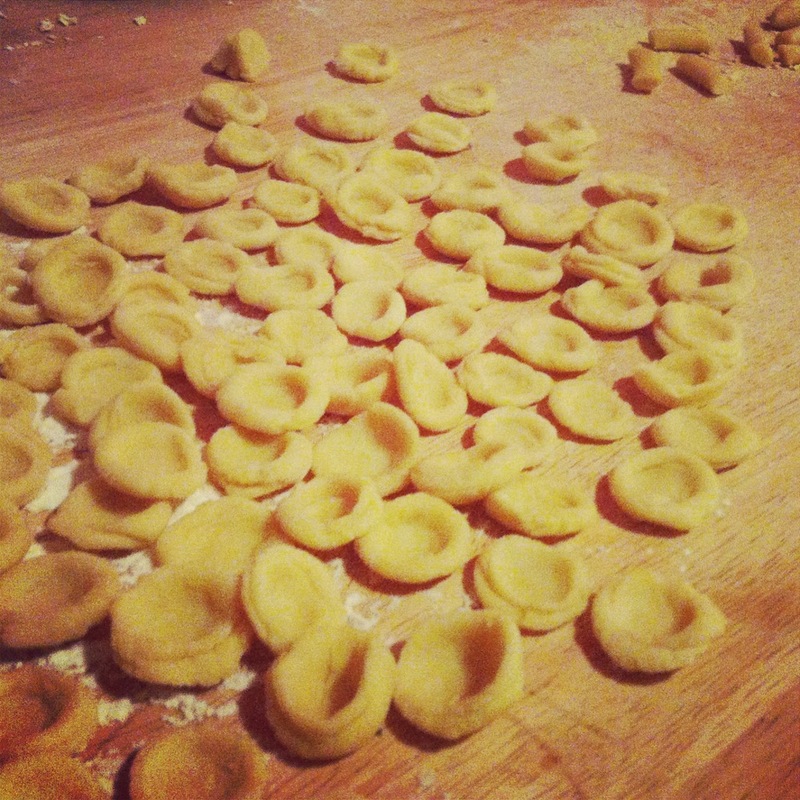 It was pretty late by the time I finished making the Orcchiette so I froze it for later. It was time to use my Orcchiette. I had some Chorizo in the fridge and some white wine so I put together a very simple but delicious sauce. I cooked the Orcchiette for 2 minutes exactly and it was perfect. I added it to my sauce and viola! I am practically 100% Italian! Just kidding but it was really delicious. I will work on perfecting the recipe and post here later on. I had my confidence back! I was ready to make more! So what next? I didn't know. I felt like I needed to experiment with a new shape. So I chose bow-ties. I made a few and cooked them. Realizing they weren't turning out well. I scrapped that and moved to Garganelli. 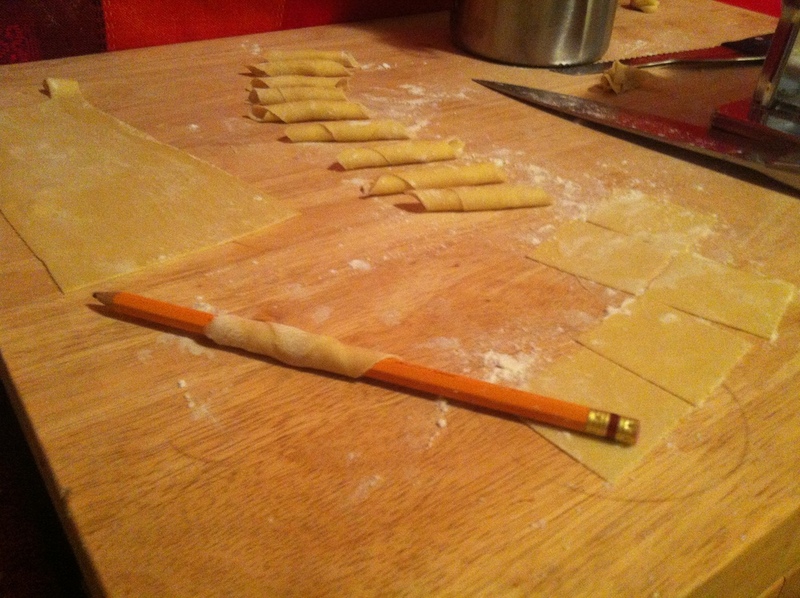 I would like to call this ghetto Garganelli because I have no tools to make this so I used a knife and a pencil. This was actually pretty each after cutting the pasta out in squares I rolled it around the pencil, prayed for it not to stick and slid it off. Pretty simple. I was using the semolina dough and really liked the consistency of my pasta. It felt right this time. I cooked a few and thought they were good. Once again it was around 1 am when I finished making the Garganelli so I had to postpone the cooking till another day. Walnut Pesto with my Garganelli! I got all these new pasta tools!! Can't wait to start making something. 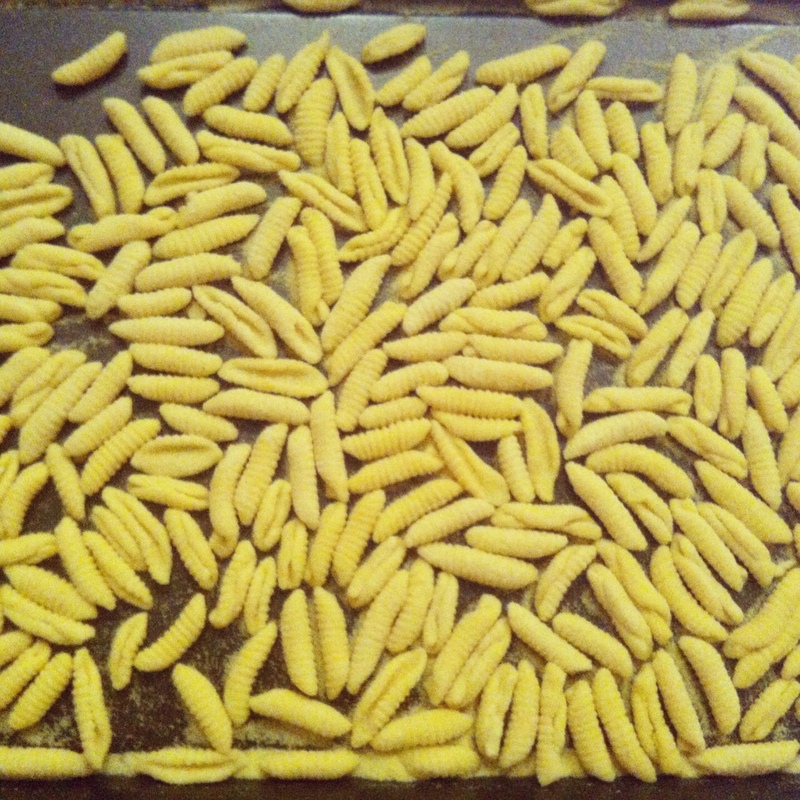 Homemade Cavatelli. The machine I used cranks these out pretty quickly.